South Korea’s headline inflation in January slipped below 1.0 percent for the first time in a year due to the sharp decline in oil prices against subdued demand. 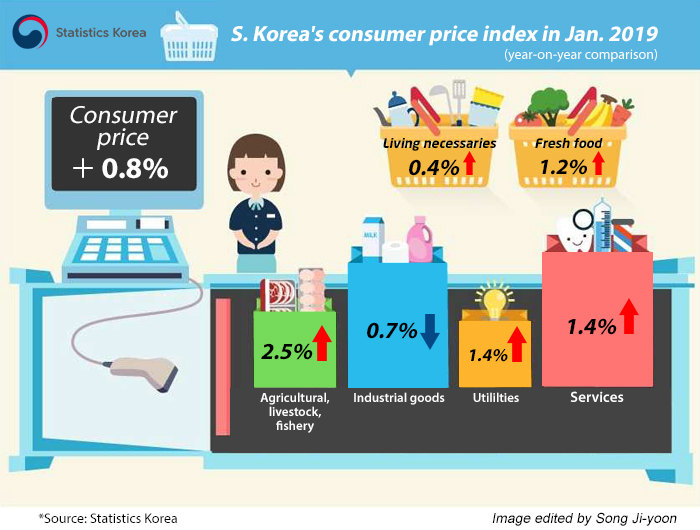 According to Statistics Korea on Friday, the country’s consumer price index (CPI) rose 0.8 percent in January from a year earlier, sliding below 1.0 percent for the first time in a year. Core inflation, which excludes volatile oil and agricultural goods, gained 1.2 percent from a year earlier, on par with previous months. The CPI that strips out food and energy categories, the standard of the Organization for Economic Cooperation and Development (OECD), was up 1.0 percent. The persistently low inflation, slowing economy and sluggish job growth at home are all reasons for Korea’s central bank to continue holding off its interest rate hikes. The Bank of Korea raised its benchmark rate only once last year to 1.75 percent in November. The case for higher interest rates has also weakened following the U.S. Federal Reserve’s surprise statement on Wednesday that signaled a prolonged pause in future rate adjustments. Prices of industrial goods including petroleum products were off 0.7 percent on year, dragging down the headline inflation by 0.22 percentage point. Gasoline prices plummeted 12.7 percent, diesel 7.0 percent and auto LPG 9.4 percent. Petroleum prices began retreating in December, falling 2.8 percent on year to mark their first decline in more than two years. The sharp descent was largely a result of the 15 percent cut in domestic fuel taxes that was introduced in November in response to hefty energy costs last summer following the unusually long heat wave. The government’s tax relief is scheduled to last until April 2019. Prices of agricultural, livestock and fishery products rose 2.5 percent, pushing up the headline CPI by 0.19 percentage point. But the gains were significantly eased from the previous three months when they averaged 7.1 percent. Service charges including rent were up 1.4 percent to lift the headline inflation by 0.77 percentage point. Public service charges fell 0.3 percent, the first decline in almost seven years. But this was offset by the 2.5 percent jump in personal service charges, which rose partly due to the 10.9 percent hike in the minimum wage last year. Utilities fees rose 1.4 percent, at a similar pace as the previous two months. The index for everyday expenses reflecting spending for stable food and utility fees rose 0.4 percent on year. The fresh food index including vegetable, fruits and fish gained 1.2 percent, decelerating sharply from the 6.6 percent rise in December.